KEE 2019: Karunya University Engineering Entrance Examination or KEE Exam is a University level Online Examination. Karunya University organizes exam and KEE Counselling every year, to provide admission to all the eligible candidates in Bachelor and Master Program in the engineering field. Latest Update: KEE 2019 Registration starts from 8th October!! Hurry up and fill the exam form, Before last date. The University already listed some of the event’s dates and important details that will happen in KEE. If you want to know more about KEE you don’t have to wander from one place to another because All the information related to KEE has been described in this article. After a brief intro let’s head to the important dates and events of KEE. As we already mentioned the Karunya University already listed some of the event’s dates and important details that will happen in KEE, so here are all the important dates and Events of KEE 2019. 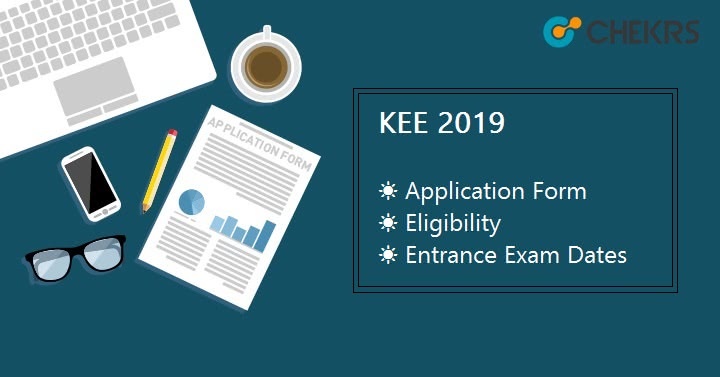 Before Blindly filling the KEE Application Form we suggest you to please take a look at the Eligibility Criteria which will clear doubt that whether you can apply for KEE 2019 or not. The Eligibility Criteria is also listed below to save your time and effort. The applicants must be an Indian national. But NRIs & foreign nationals can also apply. The candidates must have the age of 17 years minimum. The applicants must have Physics, Chemistry & Mathematics as compulsory subjects in 12th standards. For B.Tech courses through KEE, the applicants must have cleared 12 standard examinations with minimum 50% marks from recognized Board. For B.Tech (Lateral Entry) courses through KEE Exam, the candidates must have completed a B.Sc Diploma course from a recognized University. For M.Tech programs through KEE, the applicants must have completed a Bachelor’s degree in engineering with minimum 50% marks. KEE Application Form will be available probably from 1 week of November 2018, and it will be available until the last week of March 2019. Make sure to apply for the KEE examinations on or before the last date of the application process. The basic process for KEE 2019 will be as follows. The KEE Application Form will be available online so candidates have to go online at the official website of the Karunya University. The candidates have to provide the Expression of Interest (EOI) through the online application process. After providing The KEE EOI, you have to enter all the basic information such as personal information, academic information etc. on their certain place in the application form. With these basic details, You also have to upload the scanned images of your photograph & signature. After filling all these details, Next Step will be the payment of application fee. This is already mentioned below. KEE Application fee for NRI & Foreign Nationals:- US $ 60. Please keep in mind that KEE 2019 Application Fees will not be refunded, once paid. So read every detail before making payment carefully. The examination pattern provided by the examination authority is an important part of every Exam and candidates Preparation for exams. It helps Candidates to know about the exam, questions and what they have to study to clear the exam. The of KEE 2019 Syllabus and Exam Pattern is as follows. The KEE Question Paper will have total 100 questions of MCQ type questions and duration of the examination will be of 2 hours 30 minutes. The candidates will get 1 mark for each correct answer and there will be negative marking of 1/4 marks for each wrong answer. Questions will be from these subjects- Mathematics, Chemistry, Physics, General Ethics/Christian Values, General Aptitude. After filling the form and completing the payment process the candidate has to wait till April 2019 to get the KEE 2019 Admit card. The KEE Hall Ticket will be probably available in the month of April 2019. It will be issued online at the official website of the Karunya University. The candidates have to visit the official site once again and they can download the admit card from there and they also can Print the KEE Admit Card. The candidates have to carry the admit card in Examination center which will also be mentioned on the admit card with Examination dates and other details. As the Reviled dates of events, the KEE 2019 results will be declared in April 2019 on the official website. That result will have only the name of Qualified applicants and these qualified applicants will be called for the counseling process. The counseling process will be the final stair or test for KEE Admissions. If the applicants also succeed in the counseling process, they will be provided admissions to their desired courses. KEE 2019 answer key will be released after the declaration of the KEE results. The Answer Key contains all the solutions for the question paper of KEE, So the candidates will be able to compare their answer sheets answers with the Answer Key. It will help all the applicant to observe their performance and area where they need improvements. The KEE 2019 Cut off marks will be declared after the result declaration and the candidates have to score minimum cut off marks to qualify the KEE examination. All the qualified applicants will be called for the counseling process. The counseling process will be the final stair or test for KEE Admissions. For counseling, all the qualified applicants will have to bring their original documents for verification. If the applicants also succeed in the counseling process, they will be provided admissions to their desired courses. That’s It guys, If you want a bright future in engineering field then you can apply for the KEE examination. But make sure to stay updated about this Examination through following our website, And Don’t Forget to feel the KEE 2019 Application form on or before the last date of the application process.